Ready to take your small groups to the next level? To help your small groups grow, and sustain that growth? Or maybe you’re looking to launch small groups for the very first time? Or maybe you have a Sunday school structure, and you’re curious what it would take to have an off-campus strategy alongside what you already do? If you’ve purchased the book, then fill out this form below with your receipt, and we’ll send you the bonus section. For free! Whether you’re a small group veteran or a rookie, this book will help you think practically about raising the bar for your church’s small group strategy. You’ll be encouraged and challenged. I think you’ll enjoy the ride. This book will help your church; it has mine! When I want to build something new, I like to learn from someone who’s already done it ten times…or better yet, hundreds! That’s Ben. He really does have a very clear blueprint for growing small groups. Not a rigid model or a borrowed strategy. But a simple, proven approach to accomplishing what could be a difficult task – unless you have help. And better than help is wisdom from an expert. That’s Ben, too. His hands are dirty — which is good! And his heart is pure — which is even better! So just do what he says…you won’t be disappointed. Ben is not only a trusted friend, he’s a trusted ministry advisor. One of Ben’s greatest strengths is the ability to learn and then help others learn. He’s done that for me many times. That’s also why I’m happy to see Ben write this book. If you want to know small groups, there’s no one I’d trust more to learn from than Ben. This will become known as a great resource for the Kingdom. With the precision of a surgeon, the communication skills of a seasoned author, the humor of a stand up comedian, the biblical understanding of a veteran teaching pastor, and the passion of a man whose vision is to change the world through small groups, Ben unearths how to birth and oversee a healthy and flourishing small group ministry. Wanna know what book I’ll be suggesting to first time small group pastors…? You’re holding it in your hand right now. Ben Reed is not only one of the premier small group thinkers around, but he is also a practitioner. 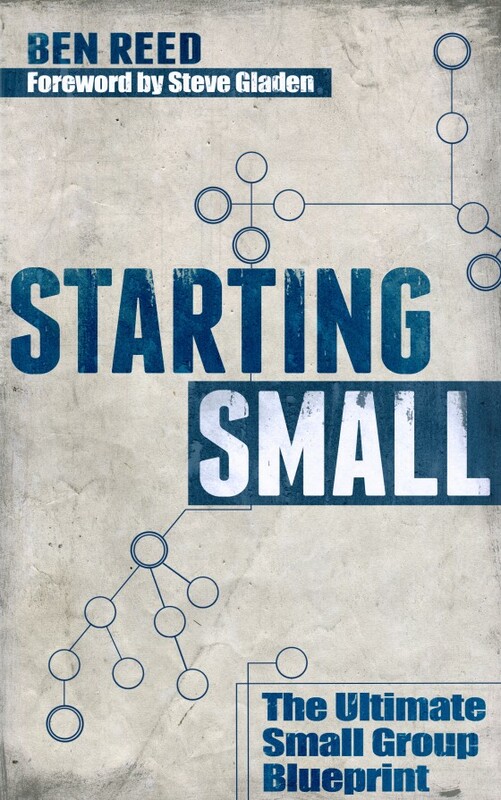 Through personal stories of successes and failures, this book will inspire both church leaders who are just exploring the idea of small groups, and seasoned group leaders that are looking for new inspiration. I highly recommend Starting Small for anyone that believes in circles over rows. Been waiting for the release, excited to get started reading this. How do we send you the receipt for the bonus content? I am so sorry…I just realized I didn’t respond to you. Please forgive me! Just fill out the form above and I’ll send you the content. Thanks for reading! Did you find it helpful?!? I sent it out yesterday, Zack. Did you get it? I did! Thanks for your help both with the Bonus content and the book. It has been a very timely resource for me as we are working through our Small Group system. Fantastic! So glad it’s proving helpful. Would you be up for leaving an Amazon review? I’d greatly appreciate it! Hi Ben. I just finished reading through your book. I think this is going to be really helpful for my church, which is on the Big Island of Hawaii. People here are somewhat suspicious of too much overt structure. Your approach has a more organic (very overused word) approach to it that taps into the personality and cultural identity of our church and community. I’m excited to get groups started. Thanks and blessings to you! I’m so, so thrilled you found it helpful! What’s the name of your church? Are you on staff? Or a volunteer? Stoked for you and the days ahead for your church! Our church is Cornerstone Christian Fellowship. It’s a small church in Kailua-Kona. I’ve been the pastor since January. I’ve got a guy in the church who’s heading up our small group strategy named Sean. He’s been to seminary and is very capable, though we’re not large enough yet to get him on staff. I’m going to turn him on to your book when we meet today. We’re looking to launch small groups in 2014, and I love the idea of the test group! Hope he enjoys the book! Hey, would you be up for leaving an Amazon review? Very helpful book for small group pastors and teams. I highly recommend it. Get it today. It’s well worth your time and investment to read it. I love the idea that “small groups can be a place where people belong so they can become.” That was a lightbulb moment for me. It’s just me managing this side of the project. And I’ve gotten behind because I just transitioned from Nashville, TN to Orange County, CA. But you should receive an email from me soon with the content! I sent it out. Did you get it, Aaron?